Designed by one of the leading manufacturers in the UK, the 12×13 Honeypot Poppy Tower Playhouse Activity Centre provides hours of fun and helps to develop important social skills. 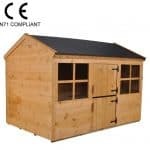 EN-71 safety tested, this fantastic playhouse is created from top quality 12mm tongue and groove cladding, backed by a 10 year anti rot guarantee. 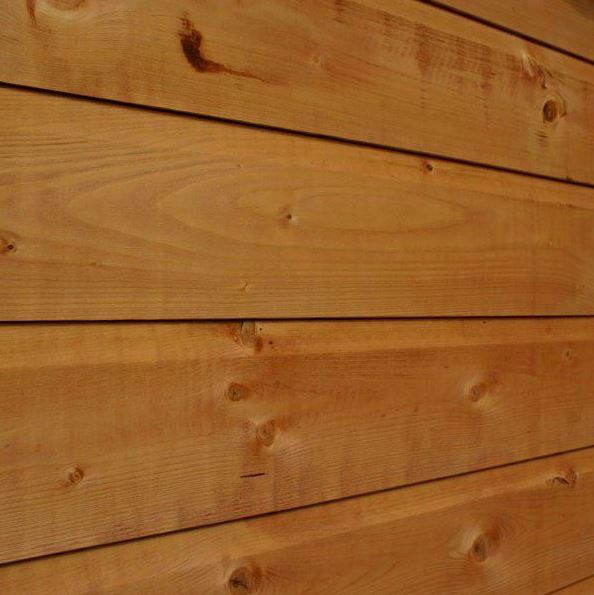 The timber has also been planed and rounded to ensure a smooth, splinter-free construction. Compared to a lot of playhouses, this one has a safer, high quality design. Even the door has been child-proofed to include finger gaps to prevent your child from trapping their fingers. A safety balcony and shatterproof styrene glazed windows also boost the buildings safety rating. Whilst the playhouse alone is impressive, it also comes complete with a fun wavy slide and a swing set. 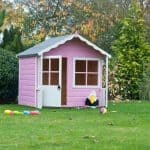 If you’re concerned about assembling the activity centre and playhouse, you can always take advantage of the installation service. This does come at an additional cost but it is worthwhile to ensure you achieve a safe, stable, stress-free build. This truly is one of the most impressive playhouse/activity centre combos available on the market. With so many features and fantastic durability, you are making a great investment when you buy this model. Solid sheet floor does meet safety regulations but we’d definitely recommend adding another sheet of wood or using bracing to help make it sturdier. The playhouse doesn’t come pre-painted so it will not look like the one in the picture. Waltons have used a coloured preservative on the trim. So if you want a painted look you will need to buy a coloured treatment. This is more than just a simple playhouse – it’s a complete activity centre. 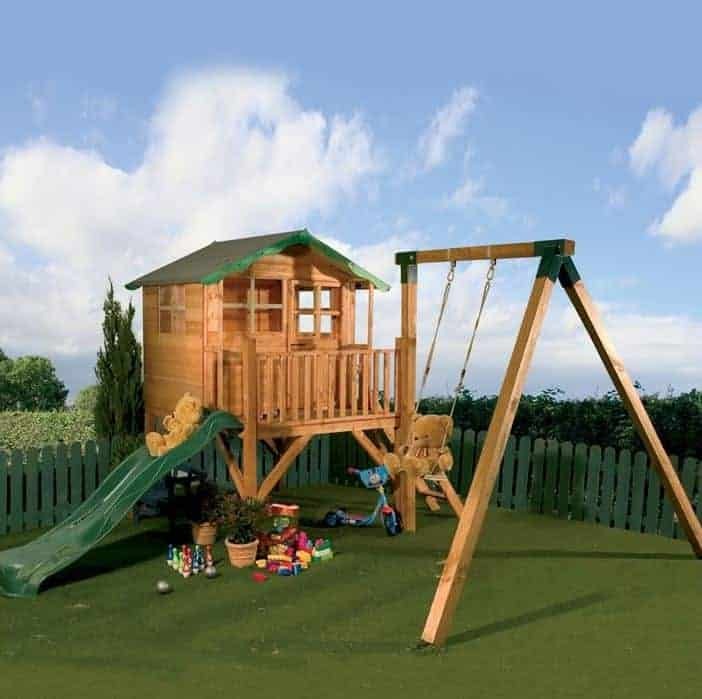 Designed to encourage imaginative play, the tower playhouse, wavy slide and swing set will help get your kids out of the house and engage in real, fun play. It’s a fairly large building, with the tower playhouse coming in at 8’7”. The door height makes it suitable for most young children and it has a spacious interior. It is important to take note of all measurements before buying to ensure it will comfortably fit into your garden. An apex roof with a fairly large overhang at the front is used on the tower playhouse. This filters rainfall quickly off the roof and also gives the building a tall, spacious interior. The overhang provides additional rainwater protection at the front of the playhouse, whilst also offering a little shade on hot, sunny days. Solid sheet board is used to construct the roof and floor, offering a strong and stable design. 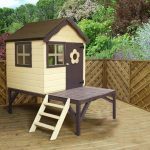 It doesn’t feature any knots or voids and offers great water resistance whilst also helping to keep the cost of the playhouse down. The exterior of the playhouse is constructed with 12mm tongue and groove. Forming a strong, interlocking design, the walls are resistant to high winds as well as water. This makes it suitable for outdoor play in all weathers. Tongue and groove also has the additional benefit of an expansion gap. This helps to prevent any potential seasonal timber changes from compromising the stability of the structure. For example, temperature and moisture changes can cause the wood to either swell or shrink. Without an expansion gap, this could affect the entire structure of the playhouse, deeming it unsafe. 27mm x 32mm framing gives the overall construction a more stable and secure build. 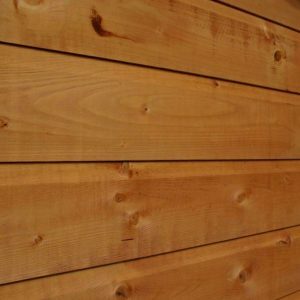 It is thicker than most wooden outdoor buildings and adds to the safety of the playhouse. In order to get the 10 year anti-rot benefit, you will need to treat the timber with a high quality preservative. This needs to be done both directly after installation and then continued every year. It is also worth noting that you will need to treat the swing set too as this also comes with a strong wooden construction. The door has a unique and safe design. In order to fully meet safety guidelines, finger gaps have been left around the door to prevent children trapping their fingers. You’ll also notice the hinge on the door has a very attractive, antique design. The small intricate details featured on the hinge show just how much thought has been given to the quality of the building. Another unique feature is the panelled glazing on the top half of the door. This adds more light into the playhouse and also enables you to keep a close eye on your children whilst they are using it. Three windows are also added for maximum lighting, with one on either side and the other located next to the door. All of the glazing is constructed from 2mm styrene, known for its safe, shatterproof design. This is one of the safest playhouse activity centres available. EN71 tested, the manufacturers have added several safety features which set it apart from similar competitor buildings. 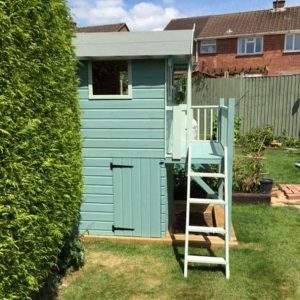 As well as a child-proof door and shatterproof glazing, the playhouse also benefits from a safety balcony and better grip ladders. The ladder has a grooved design on every step which provides excellent grip and prevents your child from slipping whilst climbing up or down. A free Golden Brown coloured treatment is included with the shed, but you will need to spend extra on different colours if you want to achieve the same look as shown in the picture. Waltons don’t offer different colours in the extras section when purchasing, but they do sell them on the site. So you will need to have a browse and add whichever colours you want separately before you check out. The extras we really like are the Plum range of toys and accessories. The manufacturer particularly recommends installing the Plum Cottage Wooden Kitchen. These accessories help with imaginative play and also add a cosier atmosphere to the playhouse. There is a link to these accessories in the product description of the playhouse on the Waltons website. As standard the playhouse comes with a heavy duty felt. This does provide adequate protection for the roof, but it could be worth upgrading to the superior felt. This is actually made from fibreglass, so unlike mineral felt it will not easily perish. It is extremely strong and will really add extra longevity to the building. Another option you have is the Poppy Tower Storage Pack. 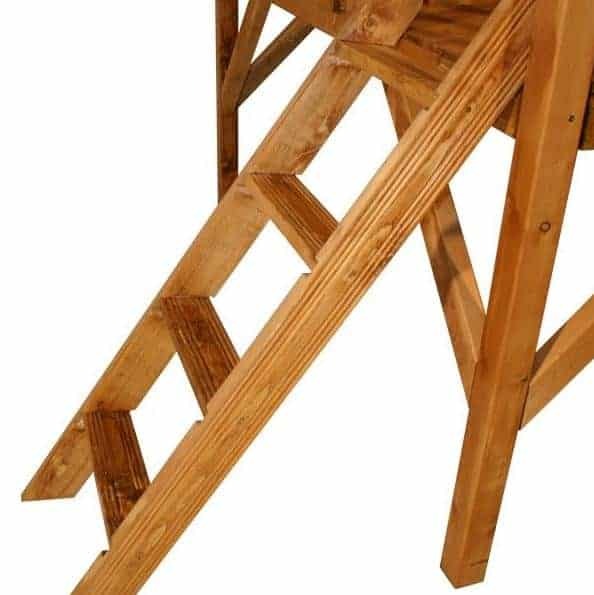 This is designed to be installed directly underneath the playhouse and it is ideal for storing accessories and toys. It is an enclosed storage area so whatever you do store in there will be kept completely safe and dry. 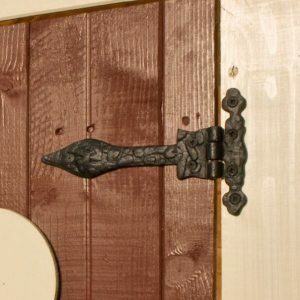 It benefits from a pull handle and a securely hinged door. As with the actual playhouse, this storage facility does not come pre-painted as shown in the picture. Your last option is the installation service. 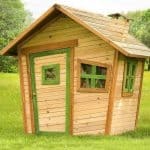 Now we do recommend this as the playhouse and activity centre is a little more time consuming to erect than a simple singular playhouse. The professional service also saves a lot of stress and the team will even clean up afterwards. It is the small details which really give away the extraordinary quality of this playhouse. The manufacturer has made sure that even the tiniest details that you wouldn’t normally think about such as the door hinge, have an intricate, top quality design. 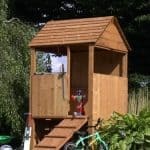 This playhouse comes with a 10 year anti-rot guarantee, but you do need to treat the wood in order to benefit. Its overall build is fantastically stable and only the highest quality materials are used for excellent durability. 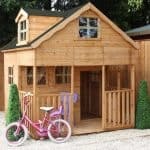 Packed with both fun and safety features, this is one of the best playhouse activity centres out there. Your child is guaranteed hours of fun and thanks to the included safety features you can leave them to play in peace. If you have basic DIY experience, you should find this pretty straightforward to put together. The instructions provided are clear and it will take around 4-6 hours to construct depending upon your experience. If you’re really concerned about putting this together yourself, you do have the option to invest in the installation service. Considering you get a wavy slide and swing set as well as a playhouse, this offers outstanding value. It’s guaranteed to last many years and will provide literally hours of fun each day for your children. Final Thoughts: This outstanding playhouse activity centre is an excellent choice. It is one of the safest models we’ve reviewed and is built to a very high standard. Consisting of a tower playhouse, wavy slide and swing set, it is sure to provide hours of entertainment for your little ones. Incredible safety features such as a child-friendly door, better grip ladder and safety balcony give you total reassurance. It is also constructed from high quality materials and benefits from tongue and groove construction. It is fairly large however so you will need to make sure you have room to install it before buying.